Prepare the candles (or oil and wicks) and matches, and a fire-proof surface upon which to place the match after lighting the candles, such as a metal or ceramic plate. 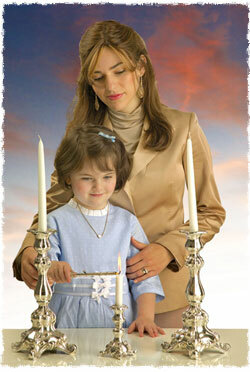 The candles should be set in close proximity to where you will eat the Shabbat meal. The candles should be sufficiently large (or the oil bountiful enough) so that the flame will burn for the duration of the meal. Many have the custom, when applicable, that the man of the household sets up and prepares the candles for lighting. Until marriage, women and girls three years and above light one candle. Post-marriage, women light (at least) two candles. Some add an additional candle for each child; e.g., a woman with three children lights five candles. Light the candles eighteen minutes before sunset—and under no circumstances later than sunset! On holidays [other than Yom Kippur] that do not coincide with Shabbat, one may light the candles after sunset, using an existing flame. The times fluctuate based on date and location. Please find current Candle Lighting Times for Barrie, here. You can also receive a free SMS reminder every Friday with candle-lighting times for Barrie. Transliteration: Baruch A-ta A-do-nay Elo-hei-nu Me-lech Ha-o-lam A-sher Ki-dee-sha-nu Bi-mitz-vo-sav Vi-tzi-va-noo Li-had-leek Ner Shel Sha-bbat Ko-desh. Uncover your eyes, gaze at the candles, and then greet everyone with blessings of "Shabbat Shalom" or "Chag Sameach" for holidays. The first woman to light Shabbat candles was our Matriarch Sarah. According to Jewish tradition, Sarah would light the Shabbat candles on the eve of the Shabbat, in the famous tent she shared with Abraham, and the candles would miraculously burn from one Friday to the next. Thus the pleasant sight of Sarah's candles greeted the many guests that visited Abraham and Sarah's tent throughout the week. Kabalah explains that Shabbat is the day that brings illumination to our world, which so often seems to be dark and negative. Furthermore, candles are a metaphor for Torah and for the human soul. The candles represent the light we introduce into the world through studying Torah and observing its precepts. And they also represent the "additional soul" which, our Sages explain, we are endowed with on Shabbat. click here to read more about Shabbat.